The third energy center – the fire chakra – is considered the source of personal power and governs self-esteem, warrior energy, and the power of transformation. 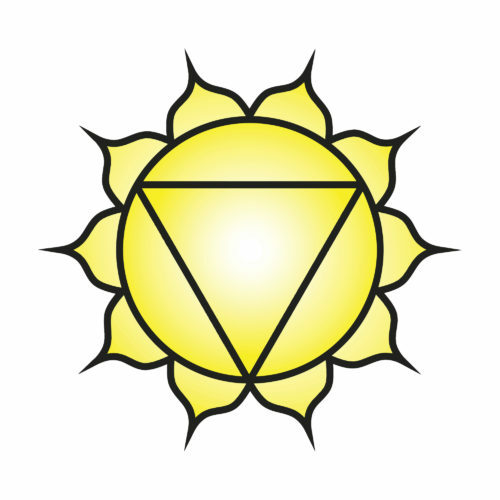 From this chakra you derive much of your feelings of well-being, confidence and sense of personal ability. The third chakra deals with willpower and is blocked by shame. Ask yourself; what are you ashamed of? What negative qualities would you like to get rid of? What can you let go of that blocks this chakra? Now offer your shame and negative qualities to the fire of transformation. I do enough. I am more than enough. I accept myself, and I stand confidently in my power. I respect differences and I express my identity without imposing my will upon others. I am in harmony with all I see. Mudra: Rudra Mudra – This mudra brings forth the power of Shiva, the Hindu god of all yogis. Navasana, Dhanurāsana, Parvritta Trikonasana, Bhujangasana. Kapalabhati pranayama or breath of fire. Vīrāsana (Hero Pose) and Vajrāsana (Sitting on the Heels) have a powerful effect on the digestion. Blocked: Depression, anxiety, confusion, rigid Ego, need for control, lack of self confidence. Open: Healthy Ego, courage, strength, balanced, self confident.